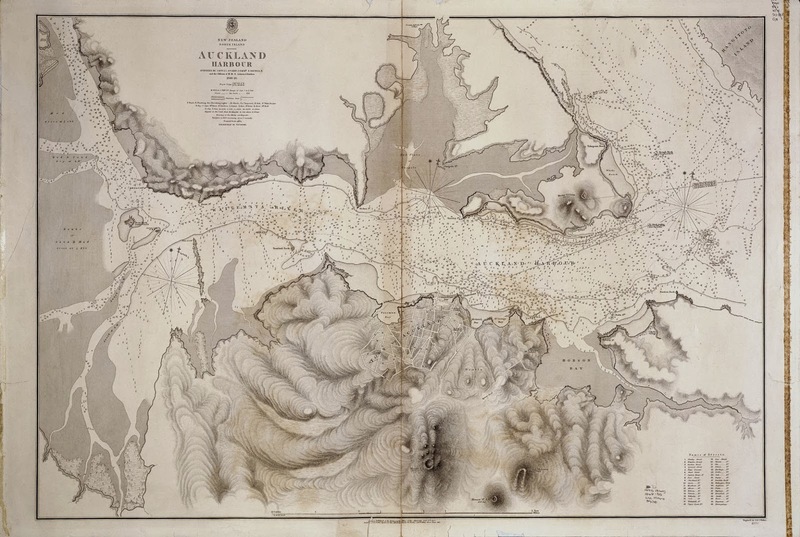 In 1848, Captain John Lort Stokes commanded the paddle-steamer Acheron, and began the first official hydrographic survey of the New Zealand coastline. Starting on Auckland's North Shore, the Acheron then traveled to Banks Peninsula, Otago, Wellington and Fiordland. In 1851, the Acheron was replaced by the smaller vessel Pandora under Commander Byron Drury. Over the next four years Drury and his officers diligently filled in the gaps on the charts for the north west coast of the North Island. According to Te Ara, 250 sheets of fair tracings had been sent to the British Admiralty for inclusion into charts by 1855. Amazingly, as recently as 1969, one or two charts which were created by Stokes and his officers were still in use. Another connection to Stokes is contained in letters written to him by his former shipmate, the great English naturalist Charles Darwin. Iain Sharp writes about the letters in Real Gold: Treasures of Auckland City Libraries. The letters, which contain unflattering comments about Grey, were included in a parcel of books sent to Grey from London. In a later letter written to Grey, Darwin's embarrassment about the incident was made clear when he mentioned he was 'much mortified'. Stokes also included a message which ensured Grey that he would find the person responsible for slipping the revealing letters into the pile of books. Sir George Grey Special Collections contains three letters written by Darwin to Grey which have been digitised and are available on the Manuscripts Online database.